The Great Leap at the Guthrie Theater, now through February 10, is funny, heartfelt and very entertaining. The play is about basketball players and the coaches who love the game, but also about identity, the American Dream and overcoming cultural barriers. The dialogue is amusingly sharp and the quirky characters immensely likeable. The title of the play alludes to both basketball and The Great Leap Forward, China’s economic campaign that led to mass deaths, arrests, famine and forced “re-education” into Communist ideology. 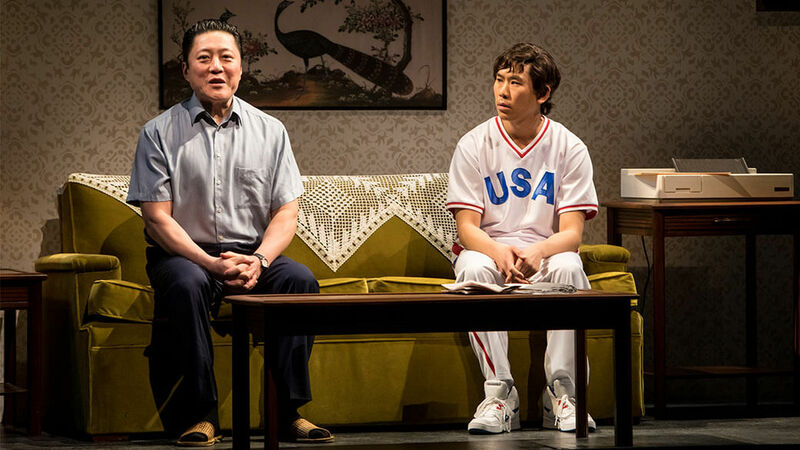 Based loosely on the story of playwright Lauren Yee’s own father, the play focuses on Chinese-American high school student, Manford (Lawrence Kao), who is obsessed with basketball and playing in the 1989 U.S.-Beijing exhibition game. He badgers the University of San Francisco basketball coach, Saul (Lee Sellars), who is leading the player delegation, until he relents. We learn that Saul had been in China in the 1960s and befriended translator-turned-coach Wen Chang (Kurt Kwan). The friendship between these two men underpins the plot and eventually overcomes the machinations of the Communist regime. Yee deftly juxtaposes the Chinese-American struggle to assimilate in the U.S and Manford’s gritty determination against China’s violent repression of its youth during the 1989 Tianamen Square protests. But the play isn’t just about basketball or politics; at heart, the play is about family and identity. Kao and Sellars are the comic relief, but Kwan gives the play its heart, with a performance that is subtle and deep.